^ Anders, Lou (2008). “Two of a Kind”. Batman Unauthorized: Vigilantes, Jokers, and Heroes in Gotham City. BenBella Books. p. 29. ISBN 978-1-935251-31-6. 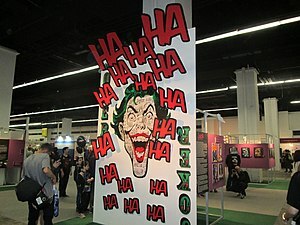 "By 2007, the Joker was indisputably one of the most dangerous and insane villains in DC's entire universe. This is evidenced in the 1995 three-issue Underworld Unleashed, in which Flash-nemesis the Trickster said, 'When super-villains want to scare each other, they tell Joker stories.'" ^ a b c Greenberger and Manning, p. 163: "In this fondly remembered tale that was later adapted into an episode of the 1990s cartoon Batman: The Animated Series, the Joker poisoned the harbors of Gotham so that the fish would all bear his signature grin, a look the Joker then tried to trademark in order to collect royalties." ^ Pearson, Roberta E.; Uricchio, William (1991). “Notes from the Batcave: An Interview with Dennis O'Neil.”. The Many Lives of the Batman: Critical Approaches to a Superhero and His Media. Routledge: London. p. 18. ISBN 978-0-85170-276-6. ^ Lewis, Paul (2006). Cracking Up: American Humor in a Time of Conflict. University of Chicago Press. pp. 31–34. ISBN 978-0-226-47699-5. ^ Manning 2011, p. 69.